“You need the scatter pattern right there,” says Mario Batali to the guy standing next to him, whose hand is poised over a platter of monster veal shanks. When the friends meet in the kitchen, the first thing they do is compare outfits. Fallon is wearing a checked flannel shirt; Batali has on a vest with the logo of his TV show The Chew. “It’s very NYC woodsman,” he says. Fallon then shows off a photo of his hard-to-get Nike SB Dunk Tiffany sneakers. He jokes that he’ll text the picture to Batali’s 14-year-old son, Leo, who wants a pair, too. “I’m going to caption the photo, ‘The power of being a grown-up,’” says Fallon. After Batali puts the veal in the oven, the men make gremolata, spiking the classic citrus-and-herb topping with horseradish. 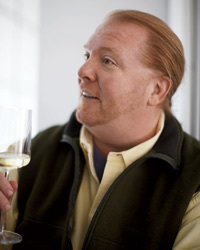 “Pass me the zester,” says Batali. “And when I say zester, you say, ‘Zester? I hardly’” “Even know her!” Fallon chimes in, with his best Austin Powers accent. The pair crack up. The last lesson: mini calzones. Batali loves the versatility of the pizza-dough base. “Once you’ve made it six times, you own it, and you’re the master of yeast,” he says, sprinkling flour on the work surface and setting out a ball of the dough. “But you have to be ready to get dirty.” He and Fallon pick up small handfuls of dough; on the count of three, they clap; flour flies everywhere. 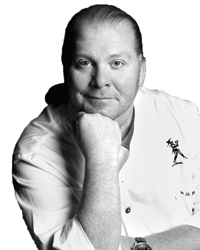 Batali: You could buy the dough at your local pizza shop if you want. You tear it into little pieces, roll it into little balls, and this is what you get. Batali: Yeah, you say, ‘I need a little bit of dough.’ So gently, with the fingertips, roll it into a piece about as big as a large sand dollar. Go to the edges and flatten them down first, because you don’t want a big dough situation. Fallon: You don’t need a rolling pin for this? Batali: You could use one, but we’re much more tactile, which is why the ladies love us. Fallon: Because they know we’re not afraid to use our hands. Batali: Now, you can make these calzones with any variation of these three fillings: There’s pesto, pepperoni and ricotta. Fallon: Let’s do all three! Batali: Alright. The trick is balance. You’d think abbondanza would be better, but more is not better. More is actually worse. Fallon: More is worse. It’s like making the right sandwich. Batali: Exactly. Too much stuff, it seems like it’s a good idea. But it’s not. OK, grab some pepperoni. Batali: I’d say four peppys. Batali: And then flatten it out so the filling goes almost to the edges. Now the fold. The world famous Batali-Fallon fold. Fallon: People have blogged about this. Fallon: They’ve created Tumblr accounts. The little, crispy fried calzones are delicious, stuffed with creamy ricotta and salty pepperoni. Fallon chooses one with green basil pesto peeking through the side. “I like this little guy,” he says. In fact, he likes it so much that he makes more for friends at home that night, with dough he bought from the pizzeria down the street. 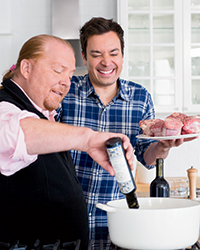 Superchef Mario Batali gives late-night host Jimmy Fallon a complete Italian cooking lesson, from braising meat to stuffing calzones.